Please just stick to geekiness: just hardware+software+education. Please don't open Pandora's box with cultural differences, religion or even politics. We can't be that hopeless that we must rely on technology websites to open up the minds across the world. Let others do it, and focus on what made this community as awesome as it is. Collaboration happened here naturally between people that differentiate in so many ways, yet regardless of who they are and what they stand for, it was just the technology and their open minds to collaboration that helped them achieve more. People will change, but it has to come from them, not forced by others. Let the technology lead the way to a better mentality. Let the people find out on their own that no matter who they are, they can find friends, allies and team mates anywhere. Forcing the humankind's way to harmony is an oxymoron. Just let it come naturally. Call me out of touch but I don't see anything referring to sexual orientation in that image. Two women, rainbow sticker on the laptop, rainbow badge on the collar. I'm not reaching at all, considering June is the LGBT Pride Month. kneekoo wrote: I'm not reaching at all, considering June is the LGBT Pride Month. And the display banner is frequently topical...so what's the problem? You have your answer in my opening post. kneekoo wrote: You have your answer in my opening post. So there shouldn't be Halloween or Christmas or Easter themed banners, either? This one is geeky enough. There is, after all, a Pi on the desk. The only overt LGBTQ references are the sticker on the back of the monitor and barely noticeable (I had to go back and hunt for it) lapel pin. On the other hand, there is a picture of the Earth and an "MAKE Space" poster on the wall, both of which are a lot bigger than the rainbow on the monitor. Looks pretty low-key to me. I think you're making way too much omelete out of very little egg. Probably most people wouldn't even have noticed if you hadn't posted about it. Banner stays. 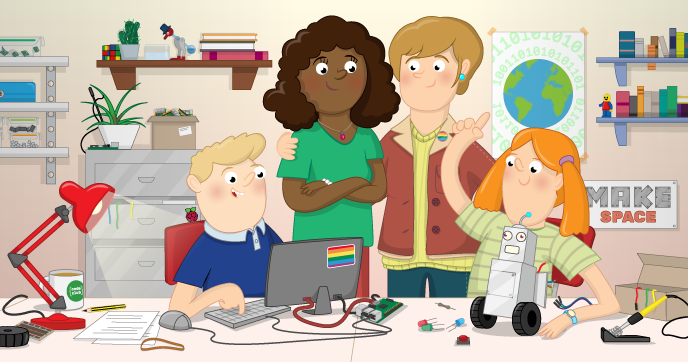 Raspberry Pi isn't just technology, it's education.